70 published items with the word (s) or phrase Bouchra Jarrar in News, Trends, Videos, Photo galleries, Agenda and sorted by "date descending". It’s official. After weeks of rumors, Lucas Ossendrijver, the long-time menswear designer of Lanvin, has left France’s oldest couture house, bringing down the curtain on a 14-year-run at the famous marque. The French house, now owned by Chinese group Fosun, has confirmed the appointment of Jean-Philippe Hecquet as its new CEO, as FashionNetwork.com reported in July. Fosun has announced its separation from Olivier Lapidus, who has headed design at the label for the past two seasons. Joann Cheng will become interim CEO. China’s Fosun International won the bidding war for Lanvin against the Qataris this month for reasons that have little to do with money, creative vision or strategy for France’s oldest fashion maison, four sources said. Chinese conglomerate Fosun snapped up the ailing French fashion label Lanvin Thursday and promised to help revive its fortunes. Lanvin staff will grill management and Fosun at a meeting on Thursday, seeking guarantees about jobs following the Chinese group's deal to buy a controlling stake in the brand, sources have told FashionNetwork.com. Troubled French fashion house Lanvin is to be relaunched before the end of the year, with plans to expand into accessories and other luxury goods, the label said on Tuesday. Auditors for Lanvin, France’s oldest fashion house, have filed a warning with a commercial court in Paris over financial troubles at the label as it struggles to stem slumping sales. Lanvin en quête d’un repreneur ? Lanvin dans une situation financière critique ? ...La marca de Jeanne Lanvin ha nombrado a Olivier Lapidus como nuevo director artístico, asumiendo el cargo de Bouchra Jarrar cuatro días después de dejar el puesto que ocupó durante 16 meses. ...La casa Lanvin, en graves dificultades financieras, ha decidido dejar de trabajar con su directora artística Bouchra Jarrar, cuyas colecciones "no llegan a seducir", según recoge una fuente cercana. Lanvin in cerca di un acquirente? Lanvin in una situazione finanziaria critica? 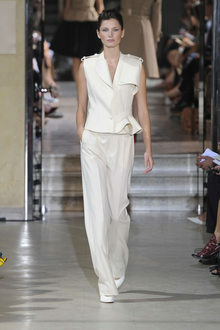 ...maison di Jeanne Lanvin ha nominato Olivier Lapidus suo nuovo direttore artistico. Il couturier parigino sostituisce Bouchra Jarrar, licenziata cinque giorni fa dalla griffe dopo soli 16 mesi in questo incarico. ...Der Couturier ersetzt Bouchra Jarrar nur vier Tage, nachdem sie vom Besitzer des Luxusmodehauses, dem 75-jährigen taiwanesischen Milliardär Shaw-Lan Wang, nach nur 16 Monaten im Haus gefeuert wurde. ...Das angeschlagene französische Luxus-Modehaus Lanvin und Kreativdirektorin Bouchra Jarrar gehen ab sofort getrennte Wege. ...представил пятнадцать изысканных моделей, а наряды от французов Кристофа Жосс (Christophe Josse) и Бухры Жаррар (Bouchra Jarrar) отличались легкостью и чувственностью. ...Olivier Lapidus é o novo Diretor Artístico da Lanvin. Ele substitui Bouchra Jarrar, demitida pela proprietária da marca Shaw-Lan Wang na semana passada, após apenas 16 meses no cargo. ...Enfrentando dificuldades financeiras, a Lanvin, renomada marca francesa, decidiu despedir-se da diretora criativa Bouchra Jarrar, cujas coleções não seduziram, de acordo com uma fonte. ...A distinta estilista de origem marroquina, Bouchra Jarrar, foi homenageada com a Ordem das Artes e das Letras. Jarrar recebeu a cruz verde da Ordem pelas mão de uma ex-ministra da República Francesa. ...Bouchra Jarrar imzalı ilk koleksiyon şıklık ve cazibeyi, romantizm ve modernliği bir araya getiren tasarımıyla büyük ilgi çekti. Paris’in en eski moda evi Kadın koelksiyonları kreatif direktörlüğünün başına Alber Elbaz'ın yerine Bouchra Jarrar’ıngetirildiğini duyurdu.